We are popular as the one of the leading manufacturer and exporter of the different kind of pallets, cages and bins. We offer finest quality retention pallets to serve the purpose of storage and transportation of different products. 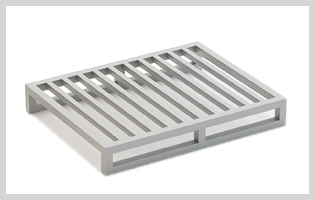 World class manufacturing facilities allow us to fabricate robust and long lasting retention pallets. These pallets make easy to handle difficult objects. They also help to make safe and easy storage and transportation of such products. We use high grade steel sheet to make the retention pallet. We also use different metals and alloys to provide specific requirement. These pallets are stackable and save space as well as transportation cost after delivery.